When and where did science begin? Historians have offered different answers to these questions, some pointing to Babylonian observational astronomy, some to the speculations of natural philosophers of ancient Greece. Others have opted for early modern Europe, which saw the triumph of Copernicanism and the birth of experimental science, while yet another view is that the appearance of science was postponed until the nineteenth century. 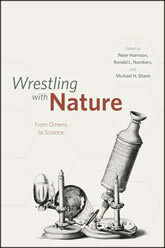 Rather than posit a modern definition of science and search for evidence of it in the past, the contributors to Wrestling with Nature examine how students of nature themselves, in various cultures and periods of history, have understood and represented their work. The aim of each chapter is to explain the content, goals, methods, practices, and institutions associated with the investigation of nature and to articulate the strengths, limitations, and boundaries of these efforts from the perspective of the researchers themselves. With contributions from experts representing different historical periods and different disciplinary specializations, this volume offers a fresh perspective on the history of science and on what it meant, in other times and places, to wrestle with nature.